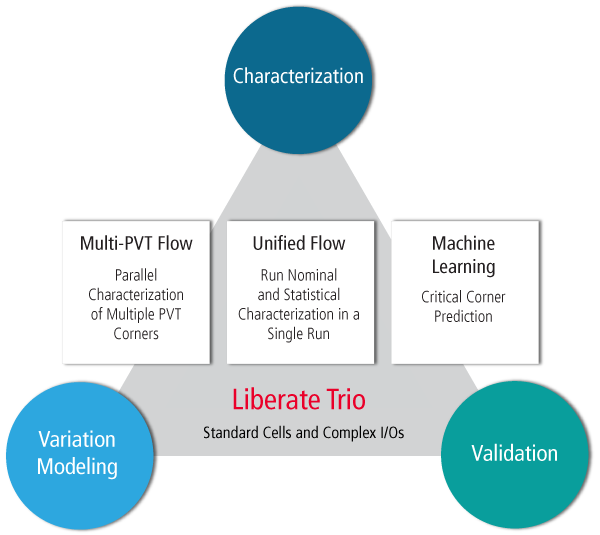 The Cadence® Liberate™ Trio Characterization Suite is the industry’s first unified library characterization system that brings together characterization, variation modeling, and library validation for standard cells, custom cells, multi-bits, and I/Os. The Liberate Trio Suite includes multi-PVT and unified flows that achieve both accuracy and high-speed performance. Its powerful combination of patented technology for generating and optimizing characterization stimulus and parallel processing capability takes advantage of enterprise-wide compute resources, and it leverages cloud resources for an enormous collection of libraries. The Liberate Trio suite is your one-stop-shop for all aspects of standard cell library characterization and validation. The Liberate Trio suite combines our tested and proven characterization suite with some of the most advanced technology available today in a unified library characterization system. The Liberate Trio suite provides a new multi-PVT flow to characterize multiple corners in the same run with the resulting libraries maintaining consistency in structure. Vectors and modeling attributes extracted from standard cell circuit analysis are shared among all corners to reduce runtime and ensure the structural symmetry need for static timing analysis (STA) scaling applications. This simplifies the challenge of dealing with an enormous collection of corners across libraries. Statistical libraries in Liberty Variation Format (LVF) and nominal libraries can now be generated using a unified characterization run that shares statistical and nominal SPICE process models. This flow eliminates the need to merge libraries at the end of a statistical run and the combined characterization run improves performance. The machine learning algorithms in the Liberate Trio suite enable prediction of critical corners through clustering techniques to determine which corners need to be characterized. The use of machine learning significantly reduces the number of libraries that will need to be characterized while ensuring accuracy using smart interpolation. Characterization of large libraries that would normally take weeks can now be turned around in days. Thoroughly distributed and massively parallel, our library characterization portfolio has been fully optimized to run on cloud-based servers by making characterization processes. The Liberate Trio suite can be used on leading cloud service providers or a company’s private cloud, and is scalable to over thousands of CPUs. Hear how the cloud-optimized Liberate Trio Characterization Suite provides characterization, process variation modeling, and validation for improved throughput and productivity.